Emma loses an important modeling job due to an injury she got while playing with her brothers. How will she pay for the beautiful holiday presents she planned for her family and friends? Emma is playing ball with her brothers on an unusually warm winter afternoon. But an errant toss from her brother Matt hits her right on the nose! Luckily, it’s nothing more serious than a little swelling, but it’s enough to make her lose an important modeling job at The Special Day salon. Mona hires “mean girl” Olivia Allen to fill in. Olivia is thrilled, not only for the job, but also for a chance to spread some nasty rumors about Emma. Worst of all, now Emma can’t afford the beautiful holiday gifts she planned to buy her family and friends. 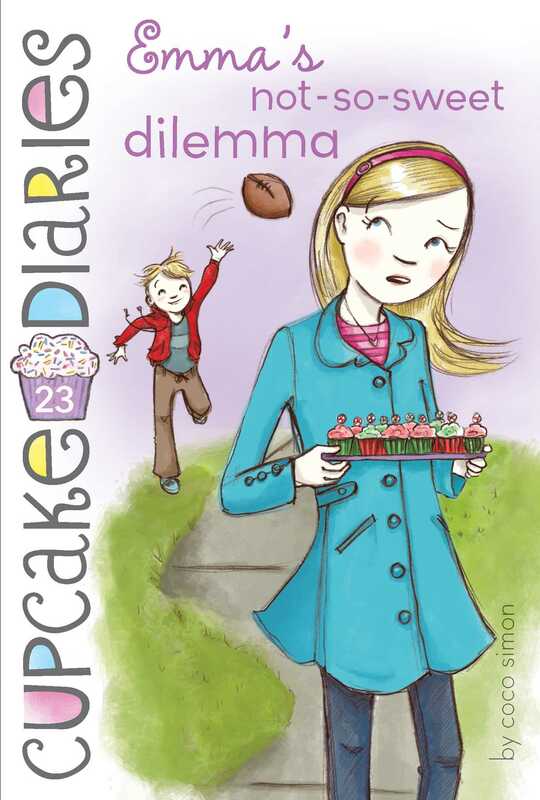 Emma’s Cupcake Club pals remind her that the best gifts come from the heart, and don’t have a price tag. My alarm went off and I hit snooze, even though I was already more than half awake. The Cupcake Club was coming over pretty early this morning to work out the kinks in a new recipe we were creating for a holiday boutique we were participating in, and I was looking forward to it. I snuggled deep under my covers and wiggled my toes in their fluffy pink socks. But I dreaded getting out of bed, even though it was a Saturday. It had been so freezing cold for the past week that I’d been walking around like a mummy in layers and layers of clothes (sleeping in socks and long flannel pj’s), and to leave my cocoon of blankets this morning would be unbearable. But then I noticed something. I could smell! I’d been suffering from a terrible cold for the past week, and my nose had been totally stuffed up. I couldn’t even taste the cupcakes we made at our last Cupcake meeting, never mind smell them cooking. (Katie was raving about the aroma, and I felt totally left out!) But now my cold seemed to have subsided, and I could smell the pancakes my mom was making downstairs. Their scent floated under the crack in my door, across the room, and tickled my nose, like in a cartoon. Cold or no, I had to have them! I braced myself, flopped back the covers, and launched out of bed. My dad insists on keeping the heat lower than most normal people would. (“Just put on a sweater!” he grumps when I’m sitting at my desk doing homework, my nose red and running from the cold.) But today I am already noticing it must be warmer outside, because when I opened my bedroom door, I didn’t have the sensation that I was entering a walk-in freezer. This day just kept getting better and better! Downstairs, my mom was listening to an author being interviewed on public radio while she bustled around the kitchen making breakfast. Besides pancakes there were hard-boiled eggs with sea salt, fruit salad, and fresh orange juice. “Good morning, sweetheart!” my mom said cheerily. She put down the pan she was drying with a dish towel. “The occasion is that it will break forty degrees today! It’s summer!” she joked. “Okay. Let’s see. Dad’s out. Matt should be home from practice any minute. Jake has a playdate at eleven. Sam is actually around today; he’s working the night shift at the theater, because he’s got to study for exams. So a busy morning but probably a quiet afternoon around here.” She put a plate down in front of me. It had a steaming stack of chocolate chip pancakes on it that looked like ginormous chocolate chip cookies. “Mmmm!” My mouth was watering. I sliced off a huge pat of butter and slathered it in between the pancakes, where it quickly melted and pooled. When I took my first bite, the saltiness of the butter and the sweetness of the pancake combined with the sharp chocolate, forming an ideal swirl in my mouth. “We should really do a chocolate chip pancake cupcake. I need to get Katie on it. She’s so good at figuring out what you need to do to make something taste like something else. Sometimes you almost have to trick your mouth. It’s cool how she knows what to do.” I took a big swig of orange juice and returned to the pancake stack. “What was that new holiday cupcake you were working on last week? That one sounded delicious,” my mom said enthusiastically. “Well, there were two, actually. One was a cherry cupcake with pistachio frosting, so it’s red and green for Christmas—get it? The other was blue and white for Hanukkah. The blue frosting was peppermint and the white cake was vanilla. It’s a great combo. Kind of like peppermint stick ice cream. I think we’ve got the Hanukkah one down, but we’re going to be tinkering with the red and green one today. My nose was so stuffed up last week, I couldn’t taste anything, so at this meeting I think I’ll be more helpful.” I inhaled deeply through my nose, and my mom smiled again. Just then my dad and Matt walked in. “Awesome!” cried Matt, running to the stovetop where my mom had a tall stack of pancakes keeping warm. He reached his hands out to grab one off the top, but my mom was there in a flash. The boys’ hands are always supergross when they get home from practice, no matter what sport it is. And they play every sport. Lucky me. Matt rolled his eyes and reluctantly went to the sink. “Can I have six, please, Mom?” he asked. “Must’ve been a big practice!” My mom laughed. “Wait, can you save a couple for the Cupcakers, please?” I asked. “The Cupcake Club is meeting here today? Oh, great.” Matt groaned, tucking into his pancake stack (with a fork this time). But he didn’t look too upset about it. My friends are really cute and my BFF, Alexis Becker, has a major crush on Matt. They’ve even had some mild date-y interaction, which for me is cool and annoying all at the same time. “You know you love it when we’re here,” I teased. “No need to get all huffy,” said Matt. “Matthew!” warned my mom, but she was laughing. “Yeah. A knuckle sandwich maybe,” I muttered. “Well, you did start it!” I said. “Hellooooo?” called someone from the mudroom, and Alexis Becker appeared. A huge grin spread across her face when she spotted Matt. I glanced at Matt to see his reaction and annoyingly enough, his face had lit up too. He was psyched to see Alexis. I didn’t watch to see if she and Matt exchanged any looks of longing, because I would have puked. We headed upstairs, and soon after, Katie Brown and Mia Velaz came up to meet us. I showed them my new skirt, and Mia, ever the fashionista (even with a homemade skirt to work with!) helped me put together three different looks with it. Since everyone had arrived, we popped down to the kitchen to get to work, with my mom’s chocolate chip pancakes to energize us. We chatted about how warm it was going to be outside for a change (sixty degrees, which is totally crazy for this time of year) while I gathered our supplies and Alexis busied herself with our ledger, where we kept track of our profits and expenses and plans. Katie laid out her idea book, which was battered and stained and laden with awesome recipes, and Mia pulled up photos of some inspirational cupcakes on her tablet. “Okay, here’s the key, girls!” Katie withdrew a little bag from her tote and opened it. Inside were a few ingredients. We clustered around while she showed us. Katie explained how the dried cherries and pistachios needed to be rough chopped, which means chopped really coarsely, and how we would be incorporating the pistachio pudding mix into our yellow cake cupcake recipe, along with some of the cherries. Then we’d swirl the cherry jam though a cream cheese frosting base and sprinkle the frosted cakes with the crushed pistachios. We all took a task and got to work, chatting as we chopped and mixed and measured. Jake and Sam both arrived and passed through, looking for swabs of frosting on a spoon or a lick of batter, but we shooed them away, with Mia (too generous always!) promising to bring them samples when the cupcakes were ready. The cupcakes were soon in the oven, and I couldn’t stop taking big gulping whiffs of delicious air through my newly cleared nose. It was like I’d been at sea for months and could finally smell land again. The girls teased me, but I didn’t mind. The cherry and pistachio cupcakes smelled wonderful. While we waited for them to come out, and then to cool, we made the frosting and brainstormed about our holiday shopping. “Everything seems so expensive to me this year,” said Katie, her brow furrowing anxiously. She was whipping up cream cheese frosting in the mixer as I chopped pistachios. “I’m hoping we’ll find some cute things at the holiday boutique,” said Mia. The boutique is an annual tradition. It’s held in the basement of our local Y, and lots of vendors come from all around with beautiful, mostly handmade and one of a kind items that make great holiday gifts. Candles, potpourri, customized stationery, needlepoint canvases and yarn, hand-knit scarves and gloves, fabric coin purses, special chocolates, fudge, and more. We would be selling cupcakes this year at a table in the refreshments area on the opening Saturday of the fair. It was a pretty big honor to be asked to participate, and that’s why we wanted our holiday-themed cupcakes to be special. While we chatted about who was on our lists to buy holiday gifts for (my list had my brothers, my parents, Mona, and the Cupcakers, of course! ), the cupcakes came out of the oven, and Mia turned them upside down on wire racks to cool. Meanwhile, Katie carefully tipped three or four drops of green food coloring into the cream cheese frosting, then mixed it until it came out a delicate green. I set the bowl of chopped pistachios next to the icing, and we were ready to frost. Just then, the boys came swarming back though the kitchen. “Yum! Mia! Can I have a cupcake now? Pretty pleeeeease?” begged Jake. “But we’re going outside now, to play football . . . ,” pressed Jake. “I’ll bring them out to you. Now, shoo! Be gone!” I whisked them out the back door before my co-clubbers had a chance to offer any more free food to them. I shut the back door hard and could hear the boys laughing outside. “Scoundrels!” I scoffed. “You know you’re lucky to have them, Em,” said Mia, laughing. “Yes, I would love to live with Matt,” joked Alexis. “Now fork over some of them cupcakes, and I’ll bring them out,” I joked to Katie. Smiling, she frosted six, and Mia sprinkled them with the nuts. I put them on a plate and headed out the back door, calling, “Cupcakes! Come and get ’em!” to the boys. But just as I rounded the corner, tragedy struck. Tragedy in the form of a very large, very hard, very out-of-control football. It hit me square in the nose, and I remember an instant shock and pain, and that’s all.